Single-PBX Phone System: If your phone system has a single PBX and it is linked to a VCC tenant, then the PBX is VCC enabled. When you create a site within the VCC-enabled PBX, the site is automatically VCC enabled. When you create a VCC user, assign the user to the VCC -enabled site. All VCC users must be assigned to a VCC-enabled site. Multi-PBX Phone System: In a multi-PBX environment, creating sites and users must be planned ahead. In the Company page, you can view the VCC tenant name and the PBX name it is linked to. When you create a site which includes VCC users, you must ensure the site belongs to the VCC-enabled PBX. While creating a VCC user, you must assign the user to a VCC-enabled site only. If you select a non VCC-enabled site, you will be disabled from assigning VCC services. Step 1: Gather the VCC tenant information from the Company page. Select Company from the main menu. In the Company page, note down the PBX name that the VCC tenant is linked to. 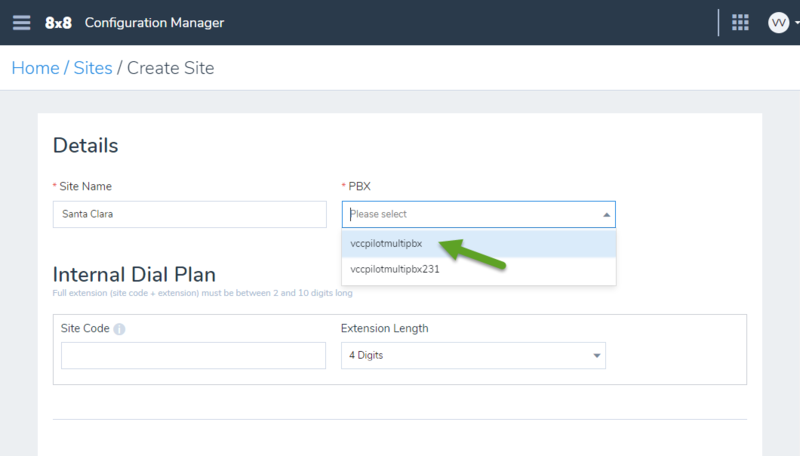 Step 2: Assign a site to the VCC-enabled PBX. When creating a site that includes VCC users, you must ensure the site belongs to the VCC-enabled PBX. Go to Sites from the main menu. Enter the basic information for the site. 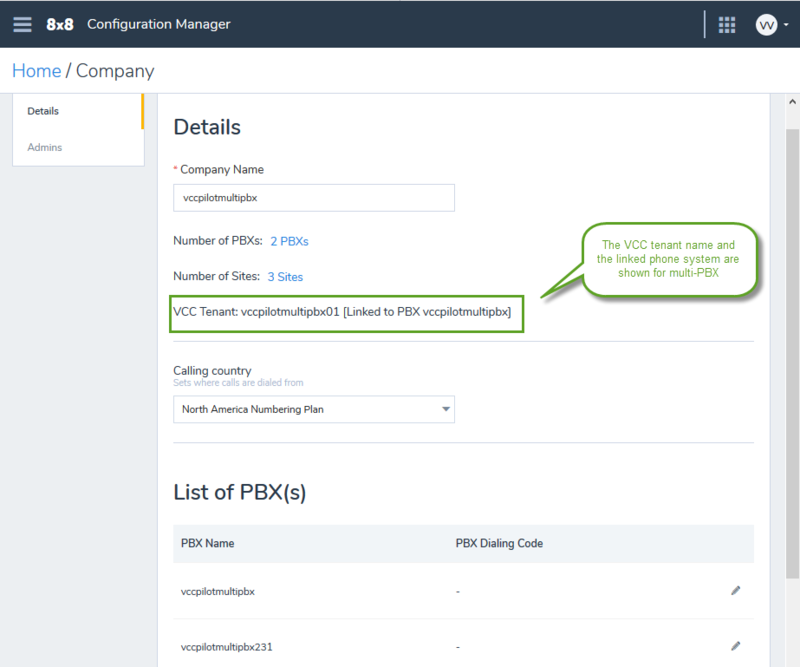 If your phone system has multiple PBXs,in the PBX field, select the VCC-enabled PBX you gathered from the Company page in step 1. Enter the required site details and save. Now this site is VCC-enabled by default. Note: All sites linked to a VCC-enabled PBX are VCC enabled by default. 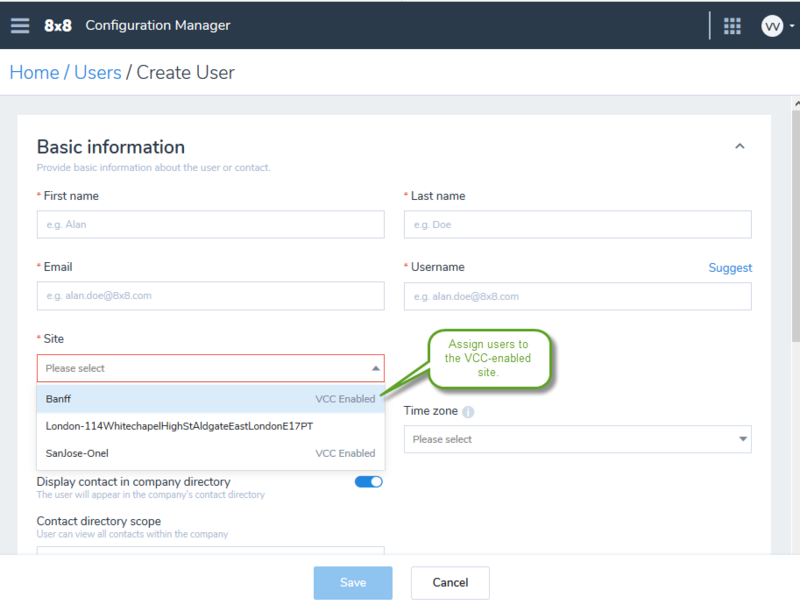 Step 3: Assign a VCC user to a VCC-enabled site. Before assigning VCC services to a user, you must assign the user to a VCC-enabled site only. Select Users from the main menu. In the basic information, select a site that is marked as VCC enabled. Continue to enter the required information and save the user. Note: All VCC users must be assigned to a VCC-enabled site.